I will have to put beetroot on the shopping list! It takes time to prepare it but looks so yummy and sure have a great taste and sure one can add it to their healthy eating plan and enjoy it. I've been buying inordinate numbers of beets at the local farmers markets - thanks for the great recipe idea! I love your blog and all the recipes you have posted.I keep trying new ones everyday. Your blog gives a great aproach to good health and well-being. Also I am interested in modifying with your permission your veganlunchbox website. I am a student taking web desgining and my instructor shows us your website very often as a teaching example, so I would like to talk more about it if you are interested. This looks fantastic. 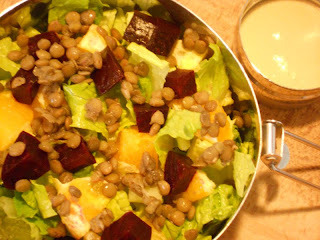 I always have leftover lentils and I've got some beets that are ready to be pulled in the garden. Yay! This looks amazing! Love lentils with citrus kick!